Bhubaneswar: While the city remained soaked in the Puja celebrations and mainly for the immersion preparations of Devi Durga, many heritage enthusiasts took the opportunity to visit the prized monuments of the city in the Old Town area and have a nice time visiting temples with Shiva, Vishnu and Shakti worshiping centres. N. Rama Subramaniam, Professor of Computer Sciences and IT at University of Dallas in USA came calling to the only guided heritage tour of the city and was overwhelmed to see such beautifully preserved monuments. A native of Tirunelveli in Tamil Nadu, Prof Subramaniam migrated to USA in 1974, but his heart still remains in India and comes to see the heritage monuments whenever there is an opportunity. “I was invited by friend Prof. KR Srivatshan, whom I once taught in IIT Kanpur in the past, where I was a faculty in Computer Science. I am really happy to discover why Bhubaneswar is called the Temple City of India,’’ said the professor from Dallas. Prof Subramaniam also added that the young people should not forget the history and heritage of the city and the city authorities should also do more to promote the unique cultural and heritage aspect of the ancient traditions. Prof KR Srivatshan, currently with Centurion University of Technology and Management on the city outskirts is an old timer at Ekamra Walks and he had visited the heritage walk in the past with his wife when he was with IIT Bhubaneswar, Arugul. Binaca Falso, a dancer from Italy, who was in Bhubaneswar to take part in a workshop on dance organized by city-based Odissi dancer from Japan Masako Ono, came to join the walks on the last day of her stay in the city. City Engineer Dwaipayana Pattanaik along with his family members also joined the 42nd Ekamra Walks today and enjoyed the heritage tour. 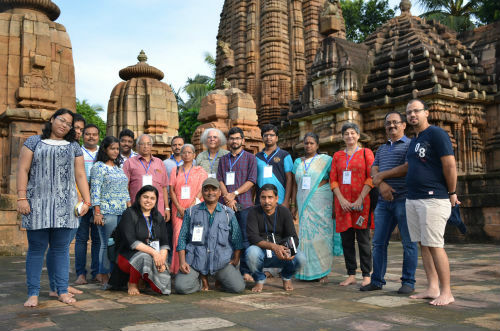 Some participants of the tour today drew sanitation issues inside and near the monuments and the City Engineer promised to take urgent steps through the Bhubaneswar Municipal Corporation and Archaeological Survey of India so that the path along the monuments and the lawns near the monuments would remain visitors’ friendly.